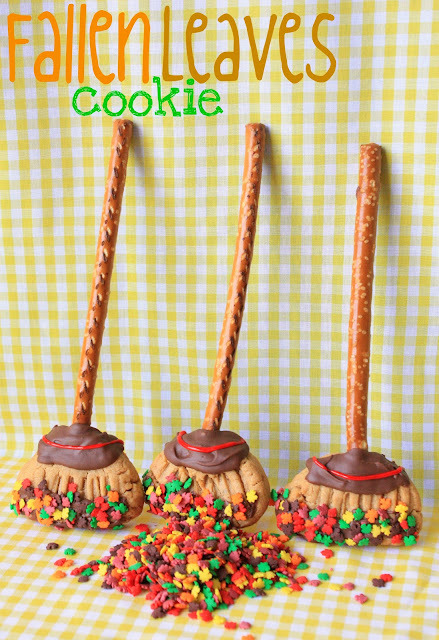 Last year I made some witch's broom cookies and thought it would be fun to make them again this year with a more general fall appeal. These cookies are a soft and tasty peanut butter cookie with a pretzel stick handle. To add some delectability each cookie is detailed with chocolate:) The bottom portion is sprinkled with autumn leaves sprinkles before the chocolate dries. We don't have an abundance of multi-colored leaves/trees in my neighborhood, but fall is in the air and I love it! It's brisk and crisp outside, perfect baking weather:) So, grab your aprons, turn on your ovens, and start baking! 1.Preheat oven to 350°F. Combine flour and baking soda in medium bowl. 2.Beat peanut butter, butter, brown sugar in large bowl with electric mixer on medium speed until creamy. Add egg and egg yolk. Gradually add flour mixture beating on low speed after each addition until blended. Shape dough into 16 (1-1/4-inch) balls. 3.Place pretzel rods on ungreased baking sheets. Press ball of dough onto end of each pretzel. Press fork firmly into each dough ball to leave indentations resembling broom bristles. 4.Bake 12 minutes. Let brooms cool on baking sheets placed on wire racks 2 minutes; remove to wire racks to cool completely. * Cookie design (broom) from Betty Crocker. Cookie recipe adapted from simple and delicious. Fall is not my favourite season (Summer is) but these cookies just may be my favourite Fall ones. These are so cute! Hope that newest (and all of) your little munchkins are thriving. i submitted this to edible crafts, this is neat. Oh my goodness..this is just too clever! I am going to have to share this one tomorrow! This is the cutest fall idea! They look good, too. I need to tell you that the munchkins are adorable....I'm sure you didn't know that -- ha! These are just precious! Can't wait to make them. Where did you find the autumn leaf sprinkles? Thanks for all of your wonderful ideas. How super cool are these, adding those sprinkles is such a clever idea. Bettie, I've had the sprinkles for awhile, but I'm slmost certain that I bought them at Michael's. Have fun! Fall is my favorite season, hands down, and I can't wait to rake the leaves..love the smell of them! Crazy, right? lol Those rake cookies and leaves are beyond amazing, Sue. You are so artistically and creatively gifted. I keep saying this, but ... I think those are the cutest cookies you've ever made! Just adorable. Sue, these are rocking awesome. I love them. How adorable and fun for little kids! These are super adorable....I wonder if these cookies would sweep their way into my kitchen....and tummy! LOL...Happy Friday! Those cookies might be great incentive to rake the yard. I know I would be willing if there was a plate of them waiting for me!! So cute. So fun! My girls would love these. So glad I stopped by Tidy Mom's link and found you. And if you get a chance, please swing by my linky (Friday Food) and share this recipe. Posted on Edible Crafts. So so awesome. These are absolutely adorable!! So creative! Hats off to you! cute!!!! thank you for sharing!!! I love how you took a Halloween treat and turned it into something so clever for fall. They could be served for so many occasions in autumn. Love them! What precious little broom sticks!! My girlie would love these. Those are the most creative fall cookies! I just love the attention to detail here. Oh now these are adorable. Love the leaves. You're one creative lady! I'm so excited that I have those leaf sprinkles! I never knew what to do with them and this is beyond adorable. Thank you Sue for always inspiring me. Sue, you are a genius! I love those fallen leaves cookies! So adorable! Oh my goodness! Each year my family gathers at my grandma's house the weekend before Thanksgiving for our annual "raking of the leaves". We rake the yard and enjoy some yummy crockpot foods and fun times. Last year I made an acorn cake. I think this will be the treat I take this year. Thanks so much for the idea! I used these cookies for a fall leaf raking party. They were awesome. Thanks for sharing, and here's a link to the party. Such a great idea, thanks again. THESE ARE THE CUTEST COOKIES EVER!!! These are too cute, can't wait to share this with our homemakers. Id like to make these for my daughters class, could you make sugar cookies instead of peanut butter? I don't see why not, Katie:) Have fun! This is such a sweet idea for fall! These look absolutely marvellous and so creative! And I bet they taste just as good too.